'Waterfront Quay' is a fantastic 2nd floor 2 bedroom apartment on the edge of the pedestrianised Gosport town centre in Hampshire directly opposite the foot passenger ferry across the Historic Portsmouth Harbour with great views of the Harbour Entrance, HMS Victory and Warrior, Gunwharf Quays and the iconic Spinnaker Tower. The apartment has been recently converted and upgraded with a stylish modern feel and has been finished and furnished to a very good 4* star standard with views over all the goings on within the harbour entrance and is only a short 4 minute ferry ride to Portsmouth and Gunwharf Quays with great transport links directly to London, The Isle of Wight, France and beyond. The apartment has 2 double bedrooms (one en-suite), a main bathroom off the entrance hallway and an a large open plan lounge/diner/kitchen with great views of the harbour. The main lounge/dining/kitchen area is modern and contemporary with laminated flooring and 3 picture windows to afford great views of what's going on in the harbour and is very well furnished with a comfortable large corner sofa which converts to create additional sleeping for 2 people, an antique cabin trunk coffee table, low modern sideboard, a solid oak circular dining table with 6 comfortable high backed dining chairs, a large flat screen wall mounted TV, Wi-Fi and music/I-Pod docking system. The open plan kitchen is well fitted with clean modern warm beech effect units, Karndean flooring, inset lighting, modern worktops, breakfast bar, integral fridge, washing machine, stainless steel oven/hob/extractor hood, microwave, cafetiere and all other essential mod cons etc. The master and 2nd bedrooms are off the entrance hallway with softer carpeted floors, large kingsize double beds which can convert to create 2 singles, modern mirrored door wardrobe units offering plenty of storage, wall mounted flat screen TV's plus the master bedroom has an en-suite with corner shower, toilet, wash hand basin, tall towel rail and warm to the foot Karndean tiling to the floor. The main high spec bathroom has a 'P' shaped bath with shower over, toilet, wash hand basin, a tall towel rail and Kardean flooring. Both bedrooms have fresh white cotton linen and crisp white towels are provided for each guest and are laid out on beds prior to your arrival. Our prices are for up to 4 people over 2 bedrooms in large 5ft king size double beds that can split to create singles plus we can accommodate 2 more people within the lounge on a double bed settee at an additional charge of £25 per week/part week per head or we charge £25 per set of extra linen requested. * Weekend and nightly rates are available on request by contacting us. Our short term rates are based on a percentage of the appropriate weekly rate. 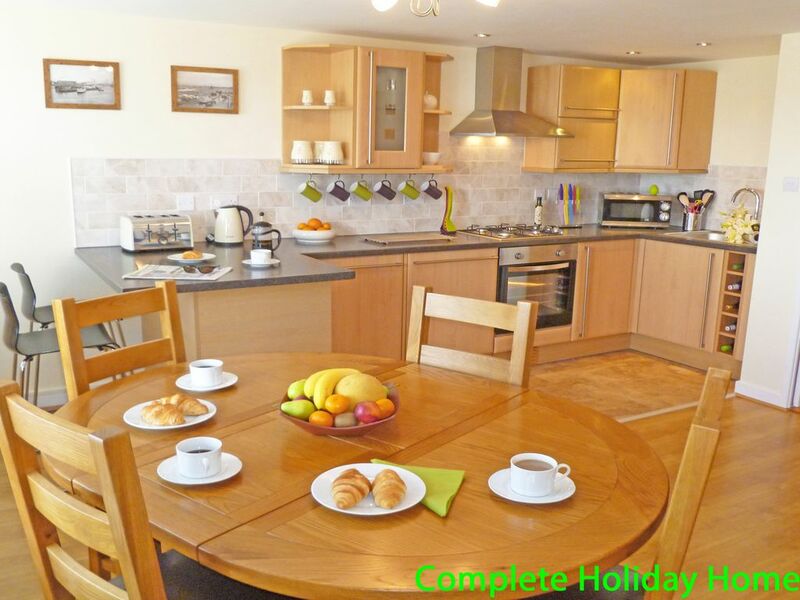 Complete Holiday Homes are a small professionally run friendly family business offering superior quality self catering holiday homes suitable for special get together, family holidays, business or crew accommodation in the southern coastal town of Gosport, Hampshire, alongside the historic naval city of Portsmouth, plus a lovely 2 bedroom apartment in the Portuguese Algarve. Whichever your destination we will strive to give the best possible service from point of booking on throughout your stay and will do our utmost to ensure your time at one of our properties is a memorable one. The apartment's great location and close proximity to Portsmouth's Historic Dockyard, home to The Mary Rose, Nelsons HMS Victory and the HMS Warrior is part of its appeal. With the addition of world class heritage sites, award-winning museums and historic trails, plus Fort Brockhurst, the 17th Century Village and the Alver Valley Country Park, Gosport is packed full of surprises and interesting places. The Dockyard and the Spinnaker Tower are only a short 4 minute ferry ride away and with the retail outlet and leisure complex of Gunwharf Quays there is a range of options for those looking to explore, shop or simply relax and watch the boats go by. The main high spec bathroom has a 'P' shaped bath with shower over, toilet, wash hand basin, a tall towel rail and warm under foot Kardean flooring. The en suite offers a toilet, wash hand basin and corner shower with a tall towel rail and warm under foot Kardean flooring. Crisp white towels are provided for each guest and are laid out on beds prior to your arrival. The living area has 3 large windows that offer great views across the harbour and is well furnished with a large corner sofa bed, an antique trunk coffee table, sideboard, dining table with 6 chairs, a wall mounted TV and an I-Pod docking system. The open plan kitchen is fitted with modern beech effect units, Karndean flooring, inset lighting, modern worktops and breakfast bar, integral fridge, washing machine, stainless steel oven/hob/extractor, microwave, cafeteria and all essential mod cons. There are a number of accessible courses locally and some include Cams Hall Estate -18 holes (6201 yards) and a 9 hole (3202 yards), designed by Peter Aliss. Wickham Park -18 holes (5868 yards), set in the lovely Meon Valley. Quindell Golf and Country Club -18 holes (5683 yards), 'a good first shot is a must on this picturesque course'. The Marriot Meon Valley -18 holes (6520 yards) and a 9 hole (2721 yards), 'a good challenge even for the experienced golfer'. Petersfield Golf Club -18 holes (6437 yards), 'with well located hazards and tight fairways'. Paultons Golf Course -18 holes (6238 yards) and a 9 hole (1324), set in the Paultons estate and Wordham golf Club -18 holes (5887), 'a very good challenge which will provide you with a mean test '. The apartment has been modernised to a good 4* star standard with beautiful decoration and tasteful furnishings throughout. The property is fully self catering but catered options are available on request and with local pubs and restaurants serving good food within a 5 minute walk you have a great choice to eat in or out. If dining out is your choice we have some fine local restaurants with fantastic coastal views or The Lightship, (a converted lightship actually sat in the water on the harbour entrance within a few minutes walk). Gunwharf Quays also has over 30 waterfront cafes/bars/bistros and restaurants sat right on the quayside on the harbour mouth where you can sit and watch the comings and goings on in the harbour and if you wish to stay on late there is a late night ferry to bring you home to Gosport up to 4am. The property is ideally positioned for walks along the foreshore or access into town and the short ferry ride from Gosport lands in Portsmouth Harbour and Gunwharf Quays which is home to the Spinnaker Tower from where you can stand on its splendid viewing platforms and look out over the water to The Isle of Wight and back inland as far as the eye can see. The property also benefits from a decked area to the rear which is a sun trap in the afternoon and offers a secluded area to read a book, enjoy a glass of wine or just relax after a busy day. Alternately within the property is a picnic basket and you could stroll across to the Ferry Gardens and sit and people watch or view the boats coming and going. All linen & towels are provided and are changed weekly with a mid week maid service available on request. Child cots and high chairs are also available at no extra cost. (If cots are provided guests are asked to bring their own child’s bedding please). The apartment is situated right on the harbour entrance and only a short 4 minute ferry ride to Portsmouth and the vibrant Gunwharf Quays with great transport links directly to London, The Isle of Wight, France and beyond. Very clean, perfect spot close to the ferry. Only the locking of the various doors was a bit of a handful. Colour code the various keys maybe? Spent 5 days in this comfortable apartment with my wife. Very comfortable bed in main bedroom with nice ensuing facilities main bathroom also very good. Apartment is close to all local shop and handy for the ferry to and from Portsmouth. Felt like home from home. Would use again if in the area. What a super flat,very well equipped very comfortable and what a view!! Very well located,just a couple of mins from the excellent Gosport Ferry over to the Historic Dockyard,and Gunwalf Quays,and half an hour walk from the Submarine Museum.Just a few paces away are the Castle Taven and the Great Wall Chinese both great value. There is little to dislike. 'Waterfront Quay' is situated on the foreshore of Portsmouth Harbour with all its comings and goings or you are a short drive to Stokes Bay, Lee on Solent and Hillhead beaches looking out over to The Isle of Wight where you are likely to find a variety of sailing enthusiasts, windsurfers, kite surfers and jet skiers. With 24 miles of waterfront and fantastic viewing points you don’t have to wander far to find the sea whether you want to go in or on it or just sit and enjoy the view. The nearest airports are Southampton, approximately 32km away, or Bournemouth, around 78km, and Gatwick and Heathrow are the nearest London airports. You can train into Portsmouth Harbour and hop straight on the 4 minute ferry to Gosport where we are situated only a 1 minute walk away from the terminal so a car is certainly not essential. 25% of rental to be paid at point of booking and the remaining 75% to be paid 45 days prior to arrival. Deposit refunded within 7 days subject to no significant damages or excess cleaning. Changeover Day: - Changeover dates and times are flexible where possible, please contact us for details. Usual arrival times are 4-6pm and departure 10am but both may be earlier or later by agreement, subject to no other guests directly before of after. Notes on prices: Short and long term stays are available. Please contact us for further pricing and availability. Additional guests over the party size of 4 are charged at £25 per head per week/part week which is payable 45 days prior to arrival.